CLICK HERE to listen to episode audio (3:49). All Web addresses mentioned were functional as of 4-13-18. From the Cumberland Gap to the Atlantic Ocean, this is Virginia Water Radio for the week of April 16, 2018. This week, we feature a springtime mystery sound. Have a listen for about 15 seconds to an April 2017 recording, and see if you can guess what bird is making the two-note, buzzing song, which you’ll hear along with a repeating song from another bird. And here’s a hint: if you have birding FE-ver, your answer may BE correct. If you guessed an Eastern Phoebe, you’re right! And if you also recognized the repeating song of a Carolina Wren, you may indeed have birding fever. The Eastern Phoebe is one of two phoebe species known in Virginia, and it’s one of over 30 North American species in the bird family of flycatchers, known for their habit of hawking, that is, flying out from a perch to catch passing insects. The Eastern Phoebe is a summer breeding resident in most of Virginia and a year-round resident in the southeastern corner and Eastern Shore. It’s found in woodlands, often near water sources. Its nest of mud, moss, grass, and leaves typically is found on rock outcrops or on various human structures, like building eaves, bridges, and culverts, specifically in places somewhat protected from predators. Those nest predators include raccoons, black rat snakes, chipmunks, mice, coyotes, and various birds. Eastern Phoebes, meanwhile, feed on a variety of flying insects along with other invertebrates, some fruit and seeds, and occasionally fish. It’s known to respond to occurrences of high insect populations, including aquatic insect hatches and swarms of midges. The Eastern Phoebe sound was recorded by Virginia Water Radio on April 16, 2017, in Blacksburg, Va.
“Spring Fever,” from the 1999 album “Four Seasons: Springsongs,” is copyright by John McCutcheon and Rounder Records, used with permission. More information about John McCutcheon is available online at https://www.folkmusic.com/. Eastern Phoebe in Shenandoah National Park, Virginia, April 4, 2017. Photo by N. Lewis, National Park Service, public domain. Accessed online at https://www.flickr.com/photos/snpphotos/33741643103/. 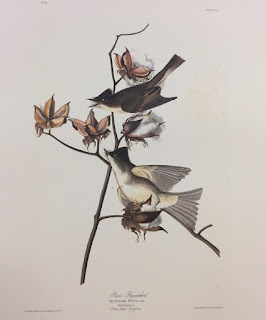 John James Audubon painting of the Pewee Flycatcher—also called Pewit Flycatcher, both of which are older names for Eastern Phoebe—originally published between 1827 and 1838 in Birds of America (plate CXX ), as reprinted in 1985 by Abbeville Press, New York. Photo taken April 16, 2018, from the reprint copy (no. 6 of 350 copies printed in 1985) owned by Special Collections of Virginia Tech Libraries. Virginia Water Radio thanks Special Collections for permission to photograph their copy and for their assistance. Information about Birds of America is available from the National Audubon Society, online at http://www.audubon.org/birds-of-america; the Pewit Flycatcher entry is online at http://www.audubon.org/birds-of-america/pewit-flycatcher. Information linking the Pewit Flycatcher plate to the Eastern Phoebe is available from Zebra Publishing, “Audubon Centennial Edition,” online at http://auduboneditions.com/index.php?go=.images.image&image_id=233&showOrnithologicalDetils=1. The scientific name of the Eastern Phoebe is Sayornis phoebe. Here are some points about the Eastern Phoebe, excerpted from the Virginia Department of Game and Inland Fisheries, “Fish and Wildlife Information Service/Eastern Phoebe,” online at https://vafwis.dgif.virginia.gov/fwis/booklet.html?&bova=040236&Menu=_.Taxonomy&version=17631. Cornell University Lab of Ornithology, “All About Birds,” online at http://www.allaboutbirds.org; the Eastern Phoebe entry is online at https://www.allaboutbirds.org/guide/Eastern_Phoebe/. Encyclopedia Britannica, “Flycatcher,” online at https://www.britannica.com/animal/flycatcher. 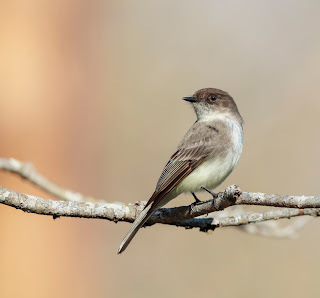 Virginia Department of Game and Inland Fisheries, “Fish and Wildlife Information Service,” online at http://vafwis.org/fwis/?Title=VaFWIS+Species+Information+By+Name&vUT=Visitor; the Eastern Phoebe entry is online at https://vafwis.dgif.virginia.gov/fwis/booklet.html?&bova=040236&Menu=_.Taxonomy&version=17631. Following are links to some other episodes on springtime. Episode 206, 3/14/14 – A Spring Serenade. Episode 212, 5/5/14 – Timing and Cues are Keys to Flowers of the Forest—Musically by No Strings Attached and Biologically by Woodland Plants. Episode 308, 3/21/16 – Treating Spring Fever with Water, Featuring ‘Until the Summer Comes’ by The Steel Wheels. Episode 408, 2-19-18 – A Frog and Toad Medley.